Writer/director Mike White (Chuck & Buck, School of Rock) has made a movie meant for the purposes of entertaining about a man who seethes with jealousy from the first frame and who reminds us and, more specifically, men of a certain age that time has or is running out. This isn't exactly the best way to get an audience who likely paid to see your movie on your side, but with the endearing presence of Ben Stiller serving as the conduit for White's exploration of middle age the well-regarded writer, who is only directing his second feature film with Brad's Status, is able to perform such explorations with such balance and well-defined introspection that the film mostly transcends its rather grim implications and is able to become one easily appreciated for its reassurance. Leave it to White, who has always excelled at crafting these kinds of human, but uncomfortably so, stories to make this reassurance not in the form of our titular protagonist finding and/or achieving what he so greatly craves for the majority of the runtime, but for discovering and realizing things he may not have considered prior. It's all about perspective and White chronicles these ideas and themes through Stiller's main character by giving him an abundance of internal monologue, but does it more convincingly by having Brad take part in actions that provoke the progression of these thoughts. Never does Stiller's Brad feel like little more than a man complaining for the sake of complaining, but rather Brad is a guy who is having a real crisis of identity. It would be easy to dismiss Brad's Status as another of those middle-aged white guys having an existential crisis movies and that's because it is, but there is something to Brad's Status that helps it rise above those kinds of dismissive criticisms by being the movie that acknowledges it's about white people problems and owns up to it. Everyone has problems, some obviously vary in degree of severity and repercussion size, but everyone has problems and issues they have to deal with and to each and every person each of their individual problems are as real as anything else. Brad takes real issue with the fact he feels he's cut himself short in this single shot at life he's been given and while White is keen to writhe just about every perspective out of this base of an idea he can what Brad's Status ultimately does is provide a way to navigate feelings of inadequacy and jealousy while coming to the realization that because everyone has their own problems that those who make Brad feel inadequate or jealous likely aren't aware of as much because they have their own things they're dealing with that their social media doesn't show. Brad (Ben Stiller) and wife Melanie (Jenna Fischer) share a laugh together. Initially, we meet Brad as he lays awake at night reminiscing on the fact he feels as if his life has plateaued when compared to that of his friend's from college. While Brad has done some credible journalism work and even jump-started his own publication for some time and won a few prestigious awards his most recent endeavor is managing a non-profit that helps to match other non-profit foundations with needy beneficiaries. His wife, Melanie (Jenna Fischer), works a government job while his son, a high school senior named Troy (Austin Abrams), is getting ready to pick a college as he's an accomplished musician that apparently has his pick of the litter when it comes to the Ivy League's. Brad seemingly hasn't been tuned in too much to Troy's accomplishments over the past few years though, as he is more concerned with the budding successes of his old friends; one of which has become a wealthy Hollywood director (White), another is an entrepreneur who has already sold his tech company and retired to Hawaii (Jemaine Clement), there is a business titan (Luke Wilson) who owns a private plane his family lavishly flaunts, and then there is a celebrity TV commentator and author, Craig Fisher (Michael Sheen), who worked for the White House. For one reason or another, Brad has been unable to shake this feeling of failure that has dominated his thoughts as of late. This idea that there was supposed to be something more in store for him as his life progressed, that he wasn't supposed to simply be content, but rather that his presence would be more prominent than what it has become. In one version of reality, Brad has a modest and comfortable life where there isn't much to complain about-especially when compared to those who have life-threatening issues such as where they might get clean water from-and yet, Brad can't help but feel bad for himself. Brad is self-aware enough to know the blame for any of these shortcomings he ponders over falls on him and him alone, but that doesn't mean he can deal with them any better-in fact, it likely makes it worse he can't blame his fruitless life on a sick parent or working class circumstances. This inner-conflict is manifested when Brad is set to accompany Troy on a trip to Boston to tour a few colleges including Harvard as well as Brad's alma mater, Tufts. This constant self-analyzing when compared to the perceived wealth and success of his contemporaries might then sound a little tedious or even too self-involved to also be enlightening, but the fact of the matter is White's execution of these thoughts are so perceptive and rather nimble that our gloomy protagonist turns out to be a rather endearing figure. Of course, it's been a given for a while now that Stiller can play these kinds of neurotic characters in his sleep as he has this ability to exude a simultaneous mix of anxiety and anger without actually speaking a word and he demonstrates that to great effect throughout Brad's Status. And make no mistake, this is Stiller's show as he carries the weight of the emotional arc of the film as well as nearly every potent emotion displayed on screen, but as the film itself separates from the "white people problems" stigma by owning up to the fact it is about middle-aged, white guy inadequacies and envies, Stiller separates his performance from that of similar films he might have done in the past (and I love the guys work with Baumbach) by not necessarily making this about his own inadequacies, whatever those might fairly be, but more about how he compares those to these unrealistic expectations he has convinced himself really exist per his college friends and the fact he feels he's somehow missing out on the same type of fabulous lives they're supposedly leading. There is more of an anguish to this-as if we can see the physical toll such thoughts are taking on Brad's posture and his mess of a hair-do. At the same time, this allows Stiller to inflict upon his performance more soul than he might have had the capacity for in the past as Brad is someone living in an age of social media where he has access to other people's lives at the tap of an app with said lives having naturally been organized and presented in a way that is most attractive and appealing to those looking in from the outside. Never do social media profiles tend to be wholly truthful about the person they represent, which is fine as it's unto each their own how they choose to portray themselves, but the result of such visibility has resulted in this unhealthy trend of judging yourself based on these expectations and, in some regards, ambitions that are unnecessary to the point it's impossible to achieve. This isn't because of any lack of talent, skill, or being deserving of as much, but simply because it's not a sustainable structure for society; there have to be people who fall through the cracks, who end up working minimum wage jobs so that services like gas stations and 24-hour drive thru's are possible while, on the other end of the spectrum, one has to question why a private jet is necessary or if it's even ethically responsible? With Brad's Status White as well as Stiller tackle this bigger idea of what pop culture has been to the average consumer, but has been amplified in the last decade by the likes of Facebook and Instagram (hence the film's title). Brad takes his son Troy (Austin Abrams) to tour colleges in Boston in Brad's Status. That said, Brad's Status still very much feels like what is just a slightly above average piece of work despite the writing being as sharp as it is. The observational moments, both in terms of honesty and comedy, as well as Stiller's performance are able to transcend the genre within which this will be classified, but overall this has the feeling of something that is not a major work, but still a notable one. I very much enjoyed myself while experiencing Brad's Status which may be the biggest compliment one can pay White and his film as it covers ground that isn't necessary the most appealing. Furthermore, it is somehow able to take this squirm-inducing subject matter that middle-aged folks would likely rather not talk about and/or ignore completely and somehow make it a rather kindhearted tale. This comes through most in the scenes Stiller shares with Shazi Raja who plays a former classmate of Troy's named Ananya who Brad sees a lot of himself in. Ananya now attends Harvard, is in the orchestra, but has ambitions of doing more as she majors in sociology. Brad sees in Ananya this sense of purpose he feels he once had, this longing to change the world, while Ananya sees in him a perspective on his self-pity that even Brad hasn't yet considered. Stiller's character makes what seems to be an unbelievably dumb and cringy decision about an hour into the film (of course, Stiller is all about wanting to be, but having to try so hard to be here) that we think it will most certainly backfire on him in some convoluted, misunderstood way, but rather it serves as the catalyst for Brad to begin to not necessarily come to terms with his life as it is as it seems Brad will always be too ambitious and compulsive to ever truly feel settled, but rather it will allow him a more narrow focus on dilemmas and circumstances that really matter and that have more of an impact on a broader scale, rather than on that of how his lifestyle stacks up to that of his friends. Speaking of his old college buddies though, both Luke Wilson and Michael Sheen have some really striking moments as both actors seem aware of what their role and contributions need to mean to the overall trajectory of the movie, but are still able to sell them as these genuine, authentic moments for these well-defined characters to the point they don't just serve their purpose, but provide some startling revelations for our titular character. The dinner scene between Sheen and Stiller, especially, is so well executed as it essentially has to capture something/feelings that are impossible to define. 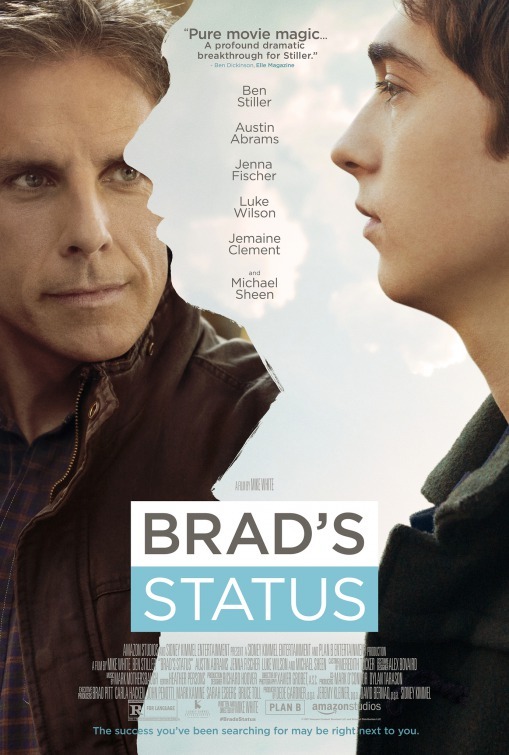 Brad's Status is a movie about the envy we all feel and the validation we all need while helping both Brad and its audience to realize that one can love the world without possessing it.